This Linux Value Stream Map Software offers you a variety of free symbols, templates and examples to create value stream map on Linux easily. 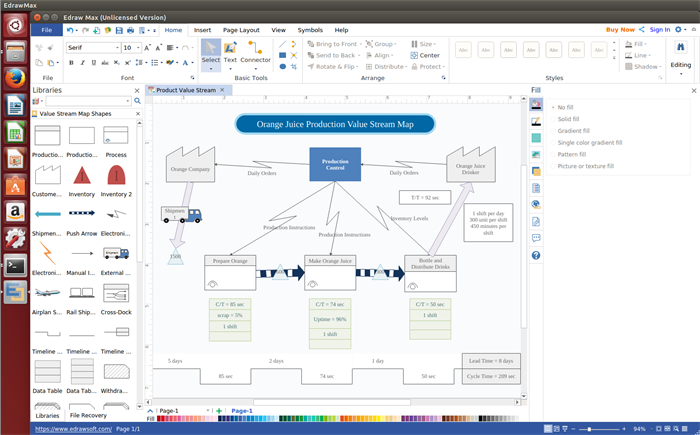 Edraw Linux Value Stream Map Software is an easy-to-use tool to produce effective value stream maps. It is loaded with smartly organized library of pre-made symbols, along with many examples and tutorials. Advanced and user-friendly drawing techniques help you enhance your productivity. Various free editable and printable value stream map templates are available for you to draw value stream maps quickly. It covers abundant shapes such as production control, process, etc, users are allowed to edit and customize your own symbols. It provides different themes options with advanced effects, you can change your diagram theme in one click. After completing the value stream maps, users can export the files to many other format like JPEG, PDF, SVG, HTML, Word, PowerPoint and so on. Launch this value stream map tool, you will find a large collection of free editable vector value stream map symbols such as customer/ supplier, inventory, shipment arrow, push arrow, electronic information, manual information, external shipment, airplane shipment, etc. Those shapes help you design value stream maps easier. Open A Value Stream Map Drawing Templates. Go to"File" menu > "New" > "Business Diagram". Double click "Value Stream Map", and then select a template you need. Add and Connect Symbols. From "Value Stream Map Shapes" library on the left panel, drag and drop related symbols to the drawing page. Then, drag connector shapes that indicate the flow of information and materials onto the page. Add Text Content. Double click a shape and then type content. 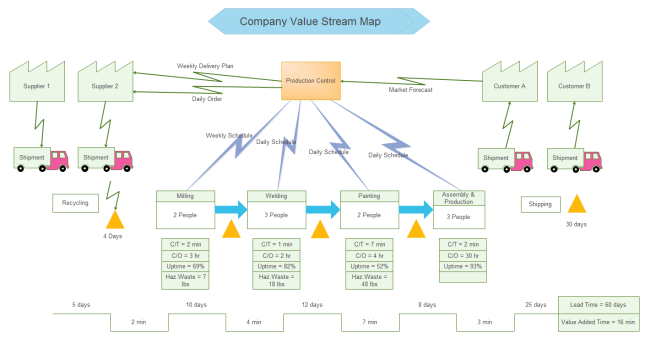 Save or Export Value Stream Map. Click "File" tab > "Save" to save the file as the default eddx format, or you can choose "Save as" on "File" tab to export to other formats such as jpg, png, pdf, html and so on. In addition, you can also print the file, simply go to the "File" menu > Print to set for print option. 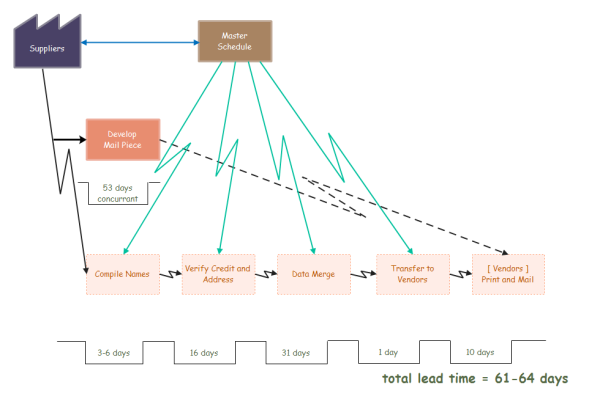 Read guide in detail: how to create value stream map. 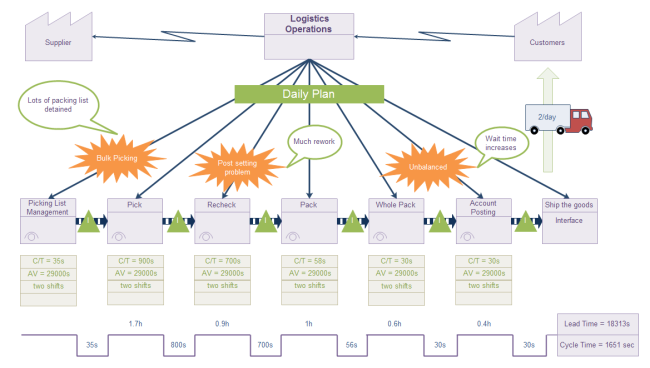 Pictures below are some value stream examples designed by our value stream map on Linux. You can free download, share or save as a template.